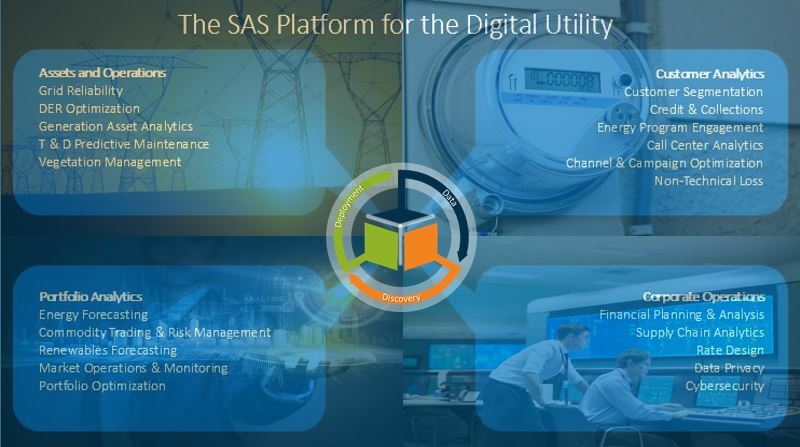 Our company talks to utilities all over the world about the value of analytics. We help utility executives understand what the "digital utility company" looks like and share use cases to illustrate how these companies are using analytics across: assets and operations; customers; portfolio, and corporate operations (see diagram below). In this second post of my four-part series, I'll highlight an assets and operations analytics use case. Assets and operations analytics use cases can be broken down into the following four sub-areas: maintenance; management; planning and optimization; and prediction. The Salt River Project (SRP) power district is one of the largest public power utilities in the US, serving around 1 million retail customers in the Phoenix area. SRP owns and operates multiple generating sources, and scheduling generator maintenance is a complex problem. The sensors from these generators produce hundreds of thousands of measurements which are analyzed to help predict when maintenance is required for each unit, helping prevent unplanned downtime. SRP also uses analytics to predict power supply and demand in order to more accurately purchase energy to better meet customer demands or sell excess power in order to keep costs down. The results of preventing unplanned downtime is just one of many inputs that are analyzed to help SRP's energy traders make better decisions about how much power they need to buy or how much excess they have to sell. Read the details of the on-going business value that analytics provide SRP. Notice that the SRP use case is similar to the one described in my first post of this series in that the value in one area (in SRP's case, assets and operations), overlaps and provides value to another area (SRP's portfolio analytics area), once again showing how valuable analytics are to any organization. David leads the pre-sales technical team for SAS US Energy which solves business problems in the Oil & Gas and Utilities industries using advanced analytics. He earned a BS in Industry Engineering and a Computer Programming Certificate from North Carolina State University. Furthermore, he has over 27 years of business experience working with SAS across R&D, IT, Sales and Marketing in the Americas and Europe. He is an expert in working with data and producing insights through the use of analytics. David has presented at SAS Global Forum, the 2012 SAS Government Leadership Summit, IBM’s Information on Demand(IOD), EMC World, CTO Summit Conferences, is the author of the book: "Big Data Analytics with SAS", and he currently holds 11 patents for SAS in several countries: US, CA, Norway, UK, China, and Hong Kong. I am very much excited to know if it can load assets from AEM (Adobe Experience Manager). Since both SAS and Adobe are built using open frameworks and support APIs the two solutions would be able to be used together.